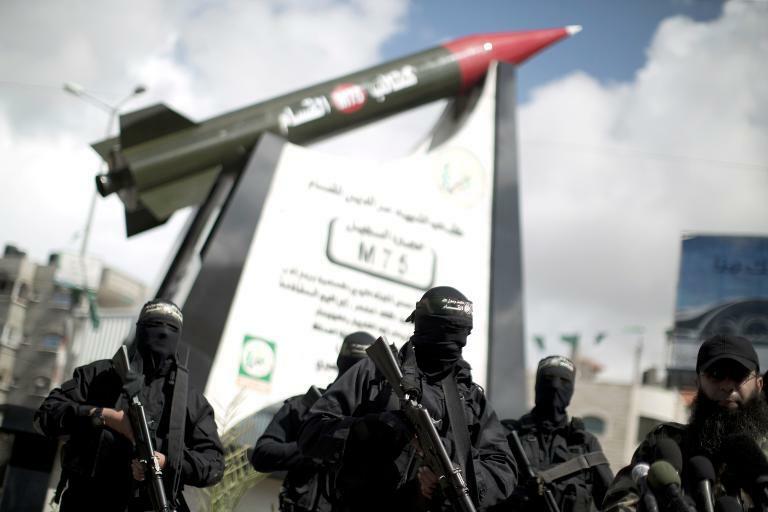 Gaza City (Palestinian Territories) (AFP) – Hamas unveiled a rocket-shaped statue Monday showcasing its capacity to strike arch-enemy Israel, as the Jewish state boasted its own haul of captured weapons it claims were bound for Gaza. “Hamas managed to take the battle to the heart of the Zionist entity (Israel) after developing its rocket system, succeeding where many Arab armies had failed,” said a leader of Hamas armed wing the Ezzedine al-Qassam Brigades, flanked by masked fighters at the statue’s unveiling. The monument in Gaza City features a life-size model of a large M75 rocket, named in honour of Qassam Brigades founding member Ibrahim al-Maqadma — who was assassinated by Israel in 2003 — and alluding to its range of 75 kilometers. M75 rockets fired from Gaza during the last major war with Israel in November 2012 struck areas around Tel Aviv and Jerusalem, almost 70 kilometres (40 miles) away. The unveiling of the black-and-red rocket that points skywards on a stone pedestal came as Israel was showcasing a shipment of arms it claims to have captured on its way from Iran to Gaza. Israel says the captured M-302 rockets have a range of 100 miles (160 kilometres), and could therefore strike anywhere inside Israel if fired from Gaza. A Hamas official at the Gaza City ceremony told AFP, on condition of anonymity, that in any future confrontation with the Jewish state, cities in the far north would be targeted. Haifa is 84 miles from Gaza, so you can’t reach that northern city with an M75 rocket. A Syrian M-302 rocket, with a range of 100 miles or more, would be just the ticket. You could say that Hamas is hiding in plain sight, except that the terrorist organization doesn’t hide its intentions at all. Neither does Iran.